Are you developing your career plan? Learn from the best! ‘What would you do, if you weren’t afraid?’ Sheryl Sandberg’s simple question in ‘Lean In: Women, Work and the Will to Lead’ has become the question of a generation. And while her book is aimed fairly and squarely at women, the question can equally be asked of men. Commencing a career is an exciting time. It is hard to imagine where you might go or what you may end up doing when you are just starting. You may hear a lot of people say that they have succeeded more by ‘good luck rather than good management’ or that they were in the ‘right place at the right time’. But more and more it is necessary to start planning your career early– they say that what you focus on grows, so focus on making your career look the way you want it to be. You have invested a lot in your career both financially and emotionally– even before you start. You need to make sure you get a return on that investment. In a previous post (view here), we wrote about how being good at your job is not enough. It is your career and you need to be in the driver’s seat. Stay tuned for more career development tips in future blogs. karen /wp-content/uploads/2017/03/empire_logo_MID_withoutpeople_Edited.png karen2015-02-04 12:06:442017-12-01 16:24:04Are you developing your career plan? Learn from the best! A lot of professional people shudder at the mere mention of networking – what some regard as an important exercise for business development, others regard as a chore. Networking can be fun and entertaining and business can be found in the most unlikely of places, especially if you approach it in the right way (it is not just about ‘getting’ business but about giving something of yourself as well). If you seriously want to develop your career you have to master the art of networking, take it seriously and use it to build and maintain relationships. Promotion will depend, in part, on your ability to do so. First of all, networking is not just about attending events and conferences, although these types of events are important and the most common. Networking could be about the people you strike up a conversation with at the gym, on the sidelines at the kids’ soccer, or at the pub on a Friday night. So think about all the places you go where you meet people and have a conversation for the first time. All of those people are potential future clients, believe it or not. We know many people who have developed business through chance encounters on a plane for example, or at a school P&F meeting. But traditional networking is about events and conferences and many of these are with professional bodies. If you are deciding what professional bodies to join, try not to join or only attend functions run by professional bodies whose only members are from the same profession. You will want to be a member of professional bodies that are multi-disciplinary to meet people who work in a different profession but in a similar industry. Be ready with a short explanation of what you do when someone asks that question. Answering ‘I’m a lawyer’ for example is not very helpful and frankly might invite pity depending on how you say it. Instead, say for example, ‘I’m a lawyer and business adviser – I work in commercial and property transactions and I really enjoy the work I do with clients’. People will remember that, especially if it is said with enthusiasm. Whenever you meet someone, take their card or write down their details. Connect on LinkedIn, and if it is a potential business opportunity, follow up with an email asking to catch up for a coffee or lunch. You never know where this will take you. The worst that can happen is that they either ignore the request or say ‘no’ – and if that happens, you are in no worse position than if you had done nothing. This takes courage and a new mindset, but if you’re serious, you will make yourself do it. Keep a record of events you go to or networking opportunities you have had, and also very importantly the ones you have knocked back. If you review this on a quarterly and annual basis you might begin to see a trend – are you attending the same type of events and meeting the same people? Are you saying no to events or opportunities because you may not know anyone there? Actively reviewing this lets you know when you need to step outside your comfort zone and try something new. 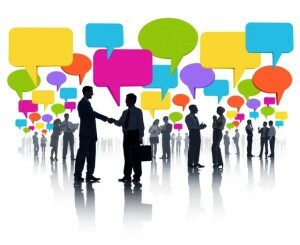 Networking can be as simple as saying ‘hello’ and taking it from there.